Following my argument in Part 1, which was expanded on and clarified by some very welcome comments, I would like to conclude this brace of postings by setting out what I hope will stand as an opening statement for a “Henley approach” to Personal Development. It will need further thought and development, of course. The Henley position needs to achieve two things. In the first instance, it must be of practical use to the managers who come on our programmes. In other words, it must serve individual goals and the unique, individual purpose behind each person’s study. Secondly, I believe it must go beyond just complementing other modules on the MBA; it must unify the individuals’ purposes with two others, namely the purpose of education and the purpose of business (as in the figure below). No small task. In Part 1 I argued that where Personal Development is mentioned on an MBA programme at all it tends to manifest either through external factors or internal ones. Where PD has been placed on the MBA in response to external factors (competitor offerings, accrediting body recommendations, assumptions about the job market and demand for preparation of students looking for jobs, and so on…) it is accompanied by a strong sense of being “bolted-on”, of consisting of cumulative add-ons. These extra components are like a buffet that a person may visit if they want (repeatedly, if they so wish) but, equally, they can ignore them too. The rhetoric of this external version is fundamentally externally focused. The programme will shout very loudly about these opportunities and will showcase them, linking them closely to the idea of the “career leap” implied by the degree offered. Yet that integrative link is by implication only and this external model is actually highly individualistic, short-term in outlook and unproven. Contrast this with the kind of approach to Personal Development on an MBA where it has emerged from internal factors. These factors are those that are (or should be) also intrinsic to the philosophy of education ascribed to by the MBA provider. Such an approach is essentially a position arrived at privately, and one would not expect any one Business School to look to, or to try to out-do, any other in this regard. Although the need to look over the neighbouring MBA School’s garden fence is not there, the vocational roots of business education would suggest a more harmonious relationship between what hiring organisations need and what the institution stands for. But even this may not be enough, as few hiring organisations ever take the time to consider why they are in business in the first place (beyond making money, which is just an abstract goal). Some, not all, organisations have become as equally short-term in their thinking as some, not all, MBAs, and just as eager to jump on band-wagons. At this point it should be noted that while the majority of MBA programmes at least cater for PD via the “add-on” approach, many do also already have elements of both the external and the internal positions. It seems that these days catering for the external factors is important (the minimum), and catering for the internal ones is desirable, if you can get it into the course. Neither, however, constitute a position to PD which unites all three elements of purpose that I mentioned earlier. 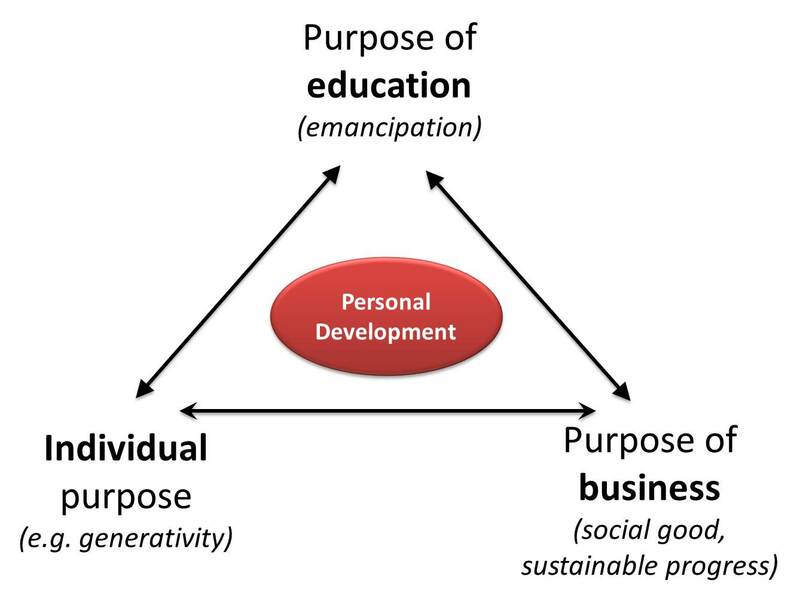 So my suggestion for the Business School is to go a step further and ask three fundamental questions about all these different forms of purpose (and I have suggested a few possible answers in the diagram above). I think this is to go beyond the QAA (Quality Assurance Agency) definition of PD as “a structured and supported process undertaken by a learner to reflect upon their own learning, performance and/or achievement and to plan for their personal, educational and career development” and allow Personal Development to be an idea that pervades every aspect of Management Education. This is therefore a meta-position on PD, and I think it that supports the role of the “question” as the primary route to learning. At the heart of PD is curiosity, both practical and philosophical. All of the modules on the MBA should have this in common, as this is the appropriate mode of enquiry in adult education. Managers are hardly ’empty vessels’ which need to be filled up with content. If anything, the problem is the opposite. Managers are so full when they arrive that they can only achieve change by first freeing up some space. They have to adopt an open-minded position to learning and doing, and the first and most important step is becoming aware that this is so. This is difficult because the prevailing experience outside the Business School (back at work) is one of knowing, of having answers, of finding solutions (and quickly) and of never questioning assumptions beyond those which stand in the way of the problem being solved. Finally, in my opinion faculty too must be part of the unification of these three sets of purpose. This will be tricky, as universities are not usually cultures that excel in being comfortable with ambiguity, or in working across disciplines, let alone in trans-disciplinary thinking. Faculties can be silos, and programmes can be merely products. But the challenge is there, and I hope that we will understand that all of these things are inextricably linked.